Semtech Corporation (Nasdaq:SMTC), a leading supplier of high performance analog and mixed-signal semiconductors and advanced algorithms, announced the expansion in China of a LoRaWAN-based network using Semtech’s LoRa® devices and wireless RF technology. The first stage will launch a test network spanning 23 kilometers across Beilin District Central University City, Xi’an, which is the historic starting point of the Silk Road. 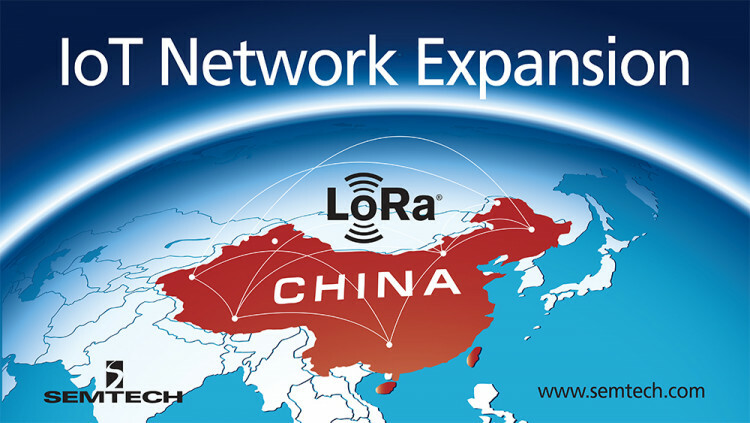 The expansion validates the commitment to globally drive the growth of LoRaWAN™ networks using Semtech’s LoRa devices and technology, offering unique and unequaled benefits in terms of bi-directionality, security, mobility and accurate localization that are not addressed by other Low Power Wide Area network (LPWAN) technologies. ThingPark™ China, the collaboration between Actility and Ginko Ventures, Xi’an Beilin District Government and Shaanxi Radio and Television Network Group will work together to develop scalable LPWANs and interoperable IoT applications and services. The networks will be initially used for environmental monitoring and smart tracking, unlocking the potential for huge social and economic benefits in the region. ThingPark China is a leading provider of IoT access platform, network management platform and innovative application development platform, co-invested by Actility, the industry leader in Low Power Wide Area (LPWA) networks and Ginko Ventures. Headquartered in Beijing, the company takes an independent business operating model and implements comprehensive localization management strategies in China for its R&D, solutions design, technical support and customer data management. ThingPark China is dedicated to building LPWA-based smart IoT platforms, as well as developing and promoting large-scale commercial applications of IoT in varied industrial verticals. ThingPark China has an exclusive license for the ThingPark™ platform in China and Taiwan. For more information, please visit www.thingpark.com. All statements contained herein that are not statements of historical fact, including statements that use the words “will,” “commitment to,” “to develop,” “designed to,” or other similar words or expressions, that describe Semtech Corporation’s or its management’s future plans, objectives or goals are “forward-looking statements” and are made pursuant to the Safe-Harbor provisions of the Private Securities Litigation Reform Act of 1995, as amended. Such forward-looking statements involve known and unknown risks, uncertainties and other factors that could cause the actual results of Semtech Corporation to be materially different from the historical results and/or from any future results or outcomes expressed or implied by such forward-looking statements. Such factors are further addressed in Semtech Corporation’s annual and quarterly reports, and in other documents or reports, filed with the Securities and Exchange Commission (www.sec.gov) including, without limitation, information under the captions “Management’s Discussion and Analysis of Financial Condition and Results of Operations” and “Risk Factors.” Semtech Corporation assumes no obligation to update any forward-looking statements in order to reflect events or circumstances that may arise after the date of this release, except as required by law. Semtech, the Semtech logo, and LoRa are registered trademarks or service marks, and LoRaWAN is a trademark or service mark, of Semtech Corporation or its affiliates.